Baruch College faculty and students demonstrated with signs and chants during the height of activity during club hours on April 11, seeking to raise awareness of the status of union contracts, as well as call for an adjunct pay raise. 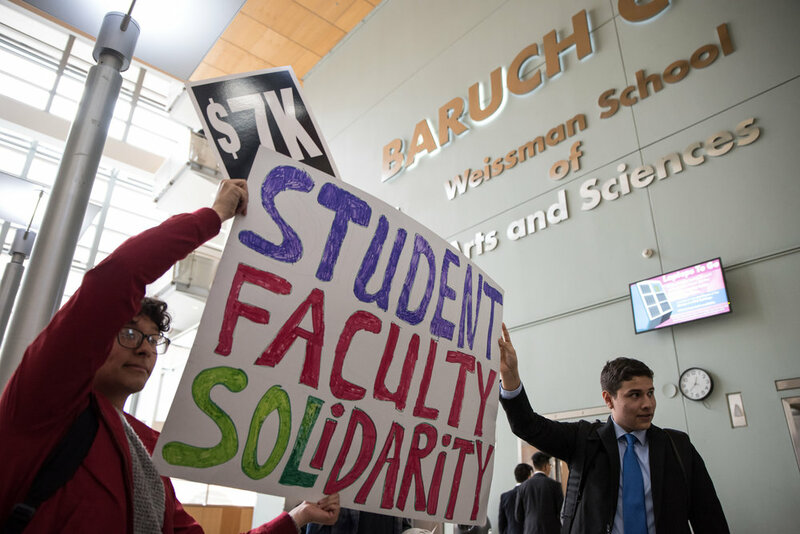 This action was organized by Baruch’s chapter of CUNY Professional Staff Congress as CUNY administrators and the PSC work through contract negotiations for pay for union members, including full-time and adjunct professors, across CUNY. Currently, PSC is bargaining for an across-the-board salary increase, doubling adjunct pay from its rate of $3,500 per course, as well as other improvements. It has been more than a year since the PSC’s contract has been renewed; its last contract only lasted a year following a five-year span without one. “Underpaid workers in understaffed departments and offices cannot provide the quality education CUNY students deserve,” stated a flyer that was distributed at the protest. “Hey, hey! Ho, ho! Tuition Hikes have got to go!” Faculty and students chanted. There have been similar events across the city since the school year began, including a protest on Wall Street and a student-led march across the Manhattan Bridge. The recent demonstration was not just contained to Baruch, as it took place across different CUNY schools including Brooklyn and City College. DiGirolamo countered that the administration’s response “becomes difficult to argue against.”He believes that the needs of the faculty deserve to be prioritized by the city, state and government. DiGirolamo explained that this issue does not just affect CUNY students and teachers, but affects many aspects of New York’s economy and cultural status. Members have voiced their grievances with administration and their lack of motivation. “The Board of Trustees met in June of 2017 … and after crying broke to the Union saying that they couldn’t fully fund or meet our demands economically, they turn around June 2017, and gave raises to administrators" said Lisa Ellis, faculty member in the library. PSC knows that it has a long road ahead of it, but is up for the challenge and will meet it head on. PSC’s next steps are to keep administration at the negotiating table, the other is to mobilize their strength in numbers. “Whether this means another kind of action on campus, whether it means more protests, whether it means more mass arrests,” DiGirolamo and team won’t stop until a “decent contract offer” is in the works. They want to continue serving the community and the students and hope that the negotiations will be “much more speedy than last time. DiGirolamo concluded. ISO brings students together for a fiery night of dance and food during annual "Arabian Nights"